This photo provided by the Rumaf, a Syrian Kurdish activist group, which has been authenticated based on its contents and other AP reporting, shows people fleeing rebel-held eastern neighborhoods of Aleppo, Nov. 27, 2016. France has called for an immediate United Nations Security Council meeting on Aleppo. In a statement, French foreign minister Jean-Marc Ayrault said "More than ever, there is an urgent need for a cessation of hostilities and unhindered access to humanitarian assistance" for residents of the besieged city. The United Nations says as many as 16,000 civilians have fled eastern Aleppo in recent days following Syrian government advances. 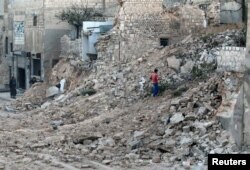 Tuesday the Britain-based Syrian Observatory for Human Rights said at least 10 civilians were killed in an airstrike in Bab al-Nairab, one of the eastern districts still held by rebel forces. Activists and Syrian state media said Monday government forces scored a series of victories over opposition fighters in the eastern part of Aleppo, as part of an apparent strategy to split the rebel-held section of the city in two. Aleppo has been a major focus of Syrian military efforts with the backing of Russian airstrikes. The situation there has also raised international concerns, with an estimated 250,000 civilians trapped in a government siege in need of food and medical aid. In Washington, the State Department expressed its "deep outrage" at the latest bombing of Aleppo, holding Moscow responsible. "What we've continued to assert is that Russia bears the ultimate responsibility here for what the Syria regime is doing and being permitted to do in terms of the devastating civilian casualties and destruction of civilian infrastructure to include hospitals in and around Aleppo," spokesperson John Kirby said Monday. 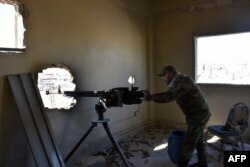 A fighter from the Syrian pro-government forces mans a gun inside damaged houses as they approach the Baeedin district in eastern Aleppo, near Masaken Hanano, November 23, 2016. Kirby said a multilateral diplomatic effort is still going on in Geneva to discuss ways to get at "a framework for a cessation of hostilities." The state-run SANA news agency cited a military source saying the army had recaptured the al-Sakhour district and dismantled mines left there by "terrorists," a term the government uses to refer to anyone opposed to President Bashar al-Assad. The Syrian Observatory for Human Rights, which monitors the conflict in Syria, also reported the military was fully in control of al-Sakhour and several other districts. Observatory director Rami Abdulrahman called the defeat the worst for the rebels since they seized half of Aleppo in 2012, and said the opposition has now lost one-third of the territory it once held in the city. A large number of people fled eastern Aleppo to the government-controlled western side in recent days. Khaled Khatib, who works for the volunteer rescue group known as the White Helmets, described the situation in eastern Aleppo as "very, very bad." "Thousands of eastern residents are moving to the western side of the city," he wrote on Twitter. "Aleppo is going to die." Government ground forces, backed by their Russian allies, began a push into eastern Aleppo earlier this month, after days of intensive bombing by Russian and Syrian warplanes. A civilian collects tree branches amid the rubble of a damaged site in the rebel-held besieged Qadi Askar neighborhood of Aleppo, Syria, Nov. 24, 2016. U.S. Ambassador Samantha Power held up the airstrikes as proof "that the [Syrian] regime and Russia are continuing their 'starve, get bombed or surrender' strategy in eastern Aleppo. Her comments to the U.N. General Assembly last week were part of a stinging critique of Russian and Syrian actions in eastern Aleppo, which intensified in September when Russian warplanes joined the bombing campaign. Moscow and Damascus have routinely described the fight against rebels in eastern Aleppo as a battle against terrorists, despite the sector's vast civilian population. Both governments have used the "terrorist" characterization to justify the deadly and apparently indiscriminate bombings in the sector. On Sunday, Russia's Tass news agency bolstered that claim with a statement saying "more and more [of eastern Aleppo] locals demonstrate they are against the crimes committed by terrorists" by fleeing to government-controlled neighborhoods. Western governments and the U.N. diplomats have scoffed at the Russian interpretation, while framing the Aleppo onslaught as a vast humanitarian crisis. Diplomats and human rights organizations argue that both Moscow and Damascus could face war crimes inquiries for their roles in the destruction of eastern Aleppo. Can Syrian Army Find New Volunteers?